Liverpool FC International Academy MA recognizes that parents have the single biggest impact on the psychological development of young players and the implications of this are huge. Get this correct and the parent can be a positive influence on the all-around development of the child. Get this wrong and it will limit their enjoyment and progression. Liverpool FC utilizes the "Magic Triangle" to highlight the importance of the parent, player, and coach relationship in this holistic approach to player development. 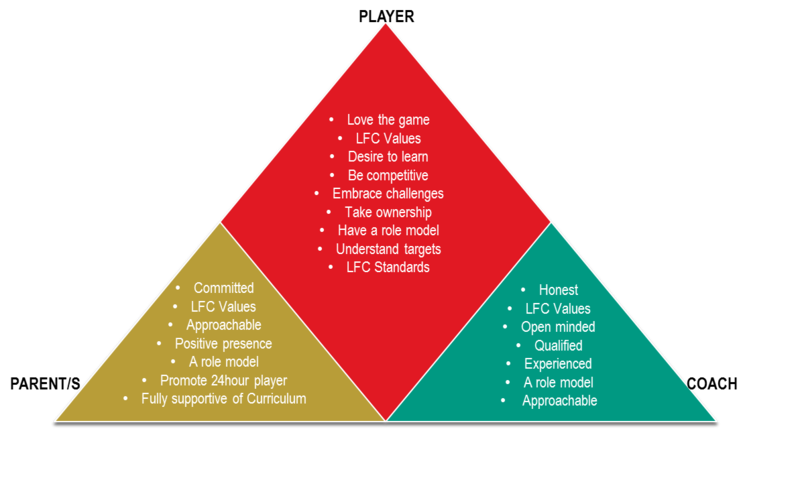 By following the Liverpool FC Parental Participation Guidelines and the "Magic Triangle” we aim to develop a relationship of respect and trust between coach, player and parents. Below is the PDF link to the 2018-19 season Parent and Player handbook. In this you will find everything you need to know for the upcoming 18-19 season as a parent or player. To assist us in pursuit of this goal and to enhance parent engagement, Liverpool FC International Academy MA will introduce a Parent Advisory Board beginning Spring 2017. This board will also advise on producing a written policy for parent engagement, a process for complaints and issues, systematic feedback and parent education.